Belle seems to dislike the number 14. I am not quite sure what it did to her. She is plenty enamored with 4. And, that 10 is a good round number is something upon which we can all agree. But, 14 is turning into a bit of a bother. Fifteen through twenty are really a breeze. And, anything up to 13 are so easy they aren’t worth discussing. What does a mother do? Well, honestly, first there is a little worry. If you don’t, more power to you. Worry, then admitting to it, and then moving on is what makes me human (that and a couple of other things including the fact that I bore children.) The next step for some of my parenting woes usually springs from some strange “call in the troops” mentality. Strange because I barely remember what ROTC stands for and look terrible in khaki; but more importantly because metaphorically screaming “charge” is really the worst sentiment when it comes to dealing with your children. In this case, I attacked with colorful books and rote memorization. This tact was actually quite fruitful—it saved me from my gung-ho tendencies for a little while. Belle must have been relieved when I gave the whole number thing a rest. For a little while I suggested she just count to ten, and then go back to one. I went back to being my less crazy self. “Sure,” I said, in a voice that was just below a cheer. “Well, now that I put another pie in the box, can you count them?” I asked. cheese and apple is such a great combination - I am still searching for my ultimate way to combine them in baking and will bookmark this recipe to try! that is very odd that belle has an aversion to the number 14 - makes me wonder what sort of adult she would make if she still couldn't cope with 14! Though I am sure that is not likely so I would expect this is not something to worry too much about. haha it seems like she just needed a little time to mull it over. Or she was so moved by these adorable little pies that she overcame her aversion! Esme does not like to go to sleep, so we are constantly preparing her for the eventuality. "What are we going to do after we read these 10 books? That's right: big girl bed." It got to the point that upon being asked any question about the proposed sequence of events, she just answered by rote. "Hey, remember where we're going after breakfast?" (Correct answer: "The carousel.") Esme: "Bed." These are darling! I'll have to try the pie crust with cheddar in it--would never have thought to do this but I loved eating fresh apple wedges along with slices of sharp cheddar when I was a kid. A winning combination! Love these! These look wonderful! 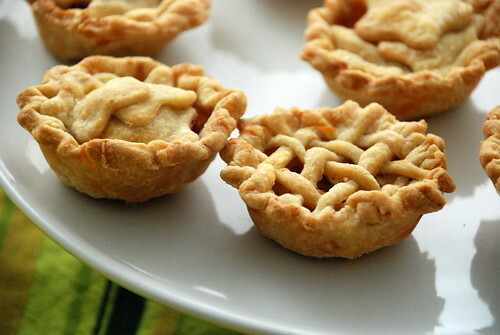 How much of each spice did you add and how long do the mini pies cook for? 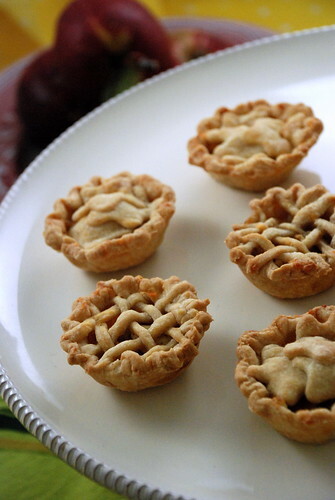 Gorgeous little pies! I hardly ever need 14 anyway, so Belle will be fine without it. Funnily enough, Chinese people do not like the number 14, so maybe Belle's just sensitive to our culture? In any case, it sounds like in this case (and many others I'm sure), pie seems to be just the perfect remedy.